Congratulations on a very successful County in the Capital event. It was extremely well organized, well attended and I found even discovered some new wineries located in Prince Edward County! Did you know that Oktoberfest actually starts in the middle to late September and runs through to about the first week of October? It is the world’s largest Oktoberfest in Germany meaning ‘folk fest’, is a beer festival or travelling funfair. The history books stated that Oktoberfest originated in Munich, Germany on the 12th of October in 1810 when Crown Prince Ludwig (later to become King Ludwig I) married Princess Therese of Saxony-Hildburghausen. The citizens of Munich were invited to attend the festivities held on the fields in front of the city gates to celebrate the happy royal event. Since then, it has become an annual festival and celebration accompanied by attractions, fun moments with old and new friends, traditional Volkfest food…..and of course a lot of German beer. Oktoberfest attendees experience a 16 to 18 day festival loaded with amusement rides, side stalls, games, and most obviously: tons and tons of beer is consumed. In fact, in 2013, a whopping 7.7 million litres of beer were served over the 16 days. You do the math! It isn’t solely focused on drinking beer. Food is just as important. Festival-goers enjoy traditional foods such as Steckerlfisch (grilled fish on a stick), Käsespätzle (cheese noodles), along with Bavarian delicacies like Obatzda (a spicy cheese-butter spread) and Weißwurst (a white sausage). “It’s a huge fun fair and there are a bunch of food vendors who most often sell roasted chicken and shredded radish. At the beginning of the festival, there’s a huge parade where each brewery gets a float which has their first beer barrels on the back,” recounts Dave Bradly who experienced Oktoberfest and lived in Munich, Germany for 7 years. Dave now resides in Ottawa, Ontario and at this time of the year longs to be hollering “Prost!” with his friends in the beer tents. “Prost” is German for “cheers”. Alternatively, you could also say “Zum Wohl” (“To your health”). Oktoberfest visitors like having a toast before drinking, a so-called “Prosit”. On the first day of Oktoberfest, the decorated floats parade into the large fields where the beer tents are equally decorated and at the strike of noon, the first barrels are ‘cracked’ to start the celebrations. Beer continues to flow for 18 days…. Just opened this summer, this craft brewery is located in Smiths Falls, Ontario. With 4 beers on tap, we thought the True North of 7 and True South of 7 would be perfect for Oktoberfest. Named for Highway 7 which runs through Ontario, extending from Quebec to Detroit. An hour’s drive west from Ottawa, this brewery located in the heart of the village of Calabogie three friends and an ‘imported’ brewer, opened the doors to this brewery, which has been so popular, they are expanding their production facility into Kanata this fall. Calabogie crafts a Kölsch-Style Ale called Front Porch. Did you know that “Kölsch” is an acknowledged regional designation and only two dozen brewers can legally call their beer “Kölsch”? This is why beers like Calabogie’s 4.2% ABV (Alcohol by Volume), 32 IBU (International Bitterness Units) Front Porch are often called Kölsch-styled – to protect the designation (much like French Champagne). This ale-like lager pours a brilliant yellow with nice aromas of lemon with a slight honey malt note. There’s a good amount of biscuit malt base in the flavour with a complimentary herbal hop note ending with crisp citrus. Photo credit: Calabogie Brewing Co.
Commissariat Old Stock Ale is currently available in a limited run at the Kichesippi retail store, and it will also be available at special events at the Museum especially in October when it celebrates its official birthday. Does it take a family to make a beer? Founder Nicolas Malboeuf has involved in his entre clan at the brewery…including his mom! Located in Embrum, the beers are unique and are always made with local ingredients. Tuque Dorée Canadian Pale Ale is a flagship beer is intended to be served very well chilled. It asserts itself as a “Canadian Pale Ale”, a new term that’s still being defined. Think about it as the craft brewer’s answer to Molson Canadian! As the name suggests, this is a clear golden colour. The head is thick and foam, with great retention. There’s a lot of flavour here, lightly bitter, a bit malty, and with a silky mouthfeel. With moderate alcohol (4.5% alcohol by volume), this is a terrific session ale. Overall, a great argument for the Canadian Pale Ale style! Pick up a can at the LCBO or The Beer Store. It still holds the bragging rights as Ottawa’s smallest brewery. And despite its size, it doubles as a speak easy too– go see it for yourself! “Hefeweizen is a German-style wheat ale, unfiltered and cloudy from the suspended yeast. Higher temperature fermentation increases the production of the flavour molecule (called an “ester”) isoamyl acetate, which tastes strongly of bananas. As a beer flavour, it can be challenging for some people. But many people DO love it, as seen by the amount produced these days by craft breweries everywhere”, explains David. Waller St.’s beer Hideaway Hefe lives up to its name: lager coloured, with light foam. “The banana is strong from the beginning – more like over-ripe banana or even those yellow banana candies we used to get as a kid. There’s some yeasty brioche, here, too, along with cloves and bubble gum. It’s certainly an unusual beer!”, states David. Friday, September 22nd and Saturday, September 23rd at Vankleek Hill Fairgrounds. A fundraiser for Ottawa Heart Institute organized by the Bier Markt at 156 Sparks Street. Thursday, September 28th to Saturday, September 30th at Myers Volkswagen Auto Haus at Clarke Fields Park in Barrhaven. Beer, food & live music. And of course…. there is always the epic Kitchener-Waterloo annual 9-day festival from October 6 to 14. Over 700,000 people make the pilgrimage to Canada’s Greatest Bavarian Festival, which turns out to be the second-largest Oktoberfest in the world…to Munich that is! The annual 9-day festival has attendance of 700,000 people – now that’s a party! It is billed as Canada’s Greatest Bavarian Festival, and is the second-largest Oktoberfest in the world. This event runs from October 6-14, 2017. Got your Savvy Summer 2-4? Summer is FINALLY here! This is our 1st ever Savvy Summer 2-4. The Savvy Brew Crew has been sampling craft beers to consider in this special assortment – yes a tough job, but we survived! Every single beer in this special parcel is perfect for summer sipping. 4 Degrees Brewing Company – BRAND NEW BREWERY! Escape to the outdoors to unlock your inner wildness a place where you can unload and find your true primal self. Brewmaster Tasting Notes: True North of 7 celebrates the true outdoors experience and is an easy drinking Helles Lager with subtle hoppy flavours and a crisp finish. Embrace a world measured in city blocks and cross streets, a place humming with power and endless possibilities. Brewmaster Tasting Notes: True South of 7 was designed with the urbanite in mind and is bolder in flavour and colour, with Amber hues and a smooth caramel flavor. Made with over 30% Appalachian Wheat and Carolina Rye from River Bend Malt House. Brewmaster Tasting Notes: These Heritage grains contribute a spicy mouth feel to this light-bodied and herbaceous Belgian Table Beer. Slightly off-center take on a rustic style. A collaboration with our friends at Birreria Volo. Brewmaster Tasting Notes: An unfiltered lager made with rye and both traditional and American hops. Stone fruit aromas are followed by an herbal spice from the rye. Brewmaster Tasting Notes: This Gose Style beer pours pale yellow with a pillowy white head. Mouth feel is light to medium. Up front tart from the kettle souring; gives way to a sharpness from the salt and then ending with a crisp, clean, dry finish. Suggested Food Pairing: Enjoy this with BBQ or sea food. Brewmaster Tasting Notes: Pilsner. This beer pours a clear light yellow with a sturdy white head. The nose is floral and earthy, over notes of corn chips. The mouthfeel is light to medium. Flavours of biscuits and crackers are balanced by a lemon citrus bitterness from the Helga Hop and Lemon Grass. Suggested Food Pairing: I’m thinking Tacos and a Patio… See The Ultimate Fish Tacos recipe at the bottom. Brewmaster Tasting Notes: Gose. The beer pours a cloudy pale yellow like its peach brother. The head is a white pillow that dissipates quickly. The nose is a blast of watermelon with the faint smell of cut flowers to back it up. Take a sip…watermelon hits your tongue like a hammer. The super fresh combination of tart, salt, and sweet watermelon are like you’re drinking a “Watermelon Jolly Rancher”. Brewmaster Tasting Notes: Pale ale. This beer pours a cloudy translucent orangey yellow. The head is thick and sturdy, lasting for ever before giving way to a beautiful sticky lacing. The nose is tropical fruit and wet pine forest. The mouthfeel is slightly bigger than medium. The flavour is exactly what you would expect from the nose… Juicy tropical fruit with huge notes of grapefruit, pine, and citrus; all balancing out this hoppy but not overly bitter pale ale. Cheers to the Ottawa Champions Baseball Club for supporting Ottawa Craft Beer since opening day 2015. Brewmaster Tasting Notes: Kichesippi Beer and The Clocktower Brew Pub worked in collaboration to bring you an easy drinking refreshing summer light beer with flavour. Our inspiration for this beer comes from our family who have been farming in Bristol, Quebec since 1925. This 150 acre farm has seen a lot of change over the years but still remains in the family. We first started out with dairy cattle and now are farming soybeans and hay. Brewmaster Tasting Notes: This stout offers a balance of roasted malts and residual sweetness. BRAND NEW! You are the first to get it. Kichesippi Beer has announced the release of a new beer that celebrates a milestone birthday for one of Ottawa’s oldest cultural attractions. This is an ale brewed to mark the 100th anniversary of the Bytown Museum. Commissariat Old Stock Ale is currently available in a limited run at the Kichesippi retail store, and it will also be available at special events at the Museum over the summer. A larger production run will take place in the autumn in conjunction with the Museum’s official birthday in October. Brewmaster Tasting Notes: An India Pale Ale with a full body. Aromas of mild malt and a robust floral bouquet. Tastes of sweet & fruit malts (i.e. apricot & mango), upfront, slight candy & biscuit notes, and grapefruit. A perfume finish. Brewmaster Tasting Notes: A light/medium body with aroma of complex hops such as citrus, tropical fruits, and pine. Tastes of lemon, orange, pineapple & mango, pine notes, crisp & light malt background, with a lingering bitterness that isn’t overpowering. Brewmaster Tasting Notes: This is a premium lager with a light body and aromas of pear & citrus notes and a hint of toasted spice. The taste is sweet fruit & citrus, slight toasted spice, hint of floral hops, and with a crisp & refreshing finish. Brewmaster Tasting Notes: A brown ale with a medium body and an aroma of sweet, fresh honey, some raisin & fig, and a hint of toasted nuts & spices. Tastes of honey, taffy, and subtle espresso. A balanced hop finish with sweet fruit notes. A nice refreshing wheat beer with character, perfect for sunny days! Brewmaster Tasting Notes: A hazy golden yellow German style wheat – a hefeweizen only slightly out of style. The fermentation profile flavours the ester production over phenol providing that signature “Banana” balanced by an unusual hop addition. This is a very refreshing and aromatic beer with an identity crisis. Dry-hopped like an IPA without any real bitterness and with a tangy tart acidity twist. Brewmaster Tasting Notes: Very refreshing with a big dry-hop character that could be easily be mistaken for tropical citrus juice. Think the mimosa of beers, only without any actual oranges. Our interpretation of this French saison style respects the light, refreshing purpose of this beer style. We made this beer with Brasserie du Bas Canada. A fun collaboration with our new friends from across the river. Brewmaster Tasting Notes: Blonde and cloudy the grisette finishes off dry, perfect for the summer heat. The compliment of yeast and hops give French Connection pleasant spice notes and a herbal aroma. Brewed with European hops along with a mixture of French and Belgian Saison yeast. Combine mince, salt, pepper, garlic and cream in medium bowl. Mix with hands until well combined. Divide mixture into 4 portions and shape into round patties. Combine tomato paste and light olive oil in small bowl; set aside. Heat remaining oil in large frying pan. Cook patties 3–4 minutes each side or until brown and cooked through. Remove patties from frying pan, drain on paper towels. Place patties on a foil-lined grill tray. Top each with overlapping slices of avocado. Brush each with tomato paste mixture. Sprinkle with combined cheeses. Cook under preheated grill for 1–2 minutes or until cheese has melted. Cut each focaccia in half horizontally. Lightly toast cut sides if desired. Place bases of focaccia on 4 serving plates. On each base, place rocket pieces and snow pea sprouts. Sprinkle with a little lime juice. Place a meat and avocado patty on top of each base, followed by remaining half of focaccia. Prepare the fish. Cut the pieces of fish into 1-ounce strips. Set up a breading station of flour, lightly beaten eggs with water, and seasoned panko bread crumbs. Season all with salt and pepper. Dredge the pieces of fish in flour, egg then bread crumbs. Once all the fish is breaded deep-fry in small batches in (375 degrees F) oil. Drain on paper towels and season with salt. Keep warm until ready to serve. Prepare the pink chile mayonnaise. Put the chipotles in a blender and puree until smooth. Add the sour cream, mayonnaise, adobo sauce and lemon juice and continue to process until the mixture is consistent and creamy. Season with salt and pepper and refrigerate until ready to use. Prepare the mango-radish salsa. Remove the peel and pith from the limes and cut between the membranes to remove the segments. Put these “supremes” into a bowl and squeeze over the juice from the membranes. Add the remaining ingredients and mix. Season and refrigerate until ready to use. You can also place all of the ingredients into a food processor and puree for a smoother salsa. To serve, set up the tacos “family-style”. Assemble the fish in a pile on a plate; the pink chile mayonnaise in a bowl; and mango-radish salsa in another. Set a pile of shredded savoy cabbage, cilantro leaves, chopped chives and lime wedges next to the fish. Toast the corn tortillas lightly over an open flame (on your stove top) and serve. Combine all salad dressing ingredients, except for sesame seeds, and using only 1 tablespoon of soy sauce. Whisk until emulsified. Taste your dressing and add another 1 tablespoon of soy sauce, if desired, to make it saltier. Add 2 tablespoons sesame seeds to the dressing and mix them in. Combine all salad ingredients in a large bowl, except for 1 tablespoon of sesame seeds and chicken. Add the salad dressing to the salad and toss – do not add all salad dressing at once: you might not need all of it. Add just enough salad dressing to coat the salad ingredients. Serve the salad in the individual serving bowls and top with the remaining 1 tablespoon of sesame seeds and sliced chicken. Monday DEAL: 50% off wine, craft beer & cider… Thought that would get your attention! At Savvy Company HQ, we’re caught up in the Cyber Monday deal-a-thons & joining in the online madness by offering 50% off TICKETS to our next wine, beer, cider event. Yes, half price tickets to this week’s Savvy Event. Heck, why not?!? It is our 5th annual Outstanding in their Fields Taste & Buy & we don’t want you to miss it. 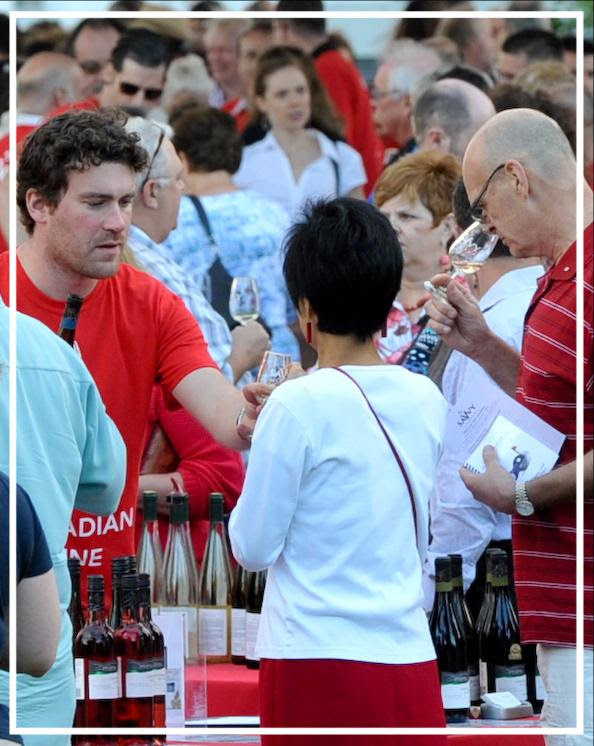 Quick…buy your half price ticket today & join us for this fun evening tasting & trying hard-to-find wines, craft beers & ciders made across Ontario….the cool part is that you get to meet the dynamic people who make these delicious bevvies. There’ll be something for everyone – sparkling, white & red wines, dessert wines, ciders made with apples & pears along with really cool craft brews too…and special prices & deals too. 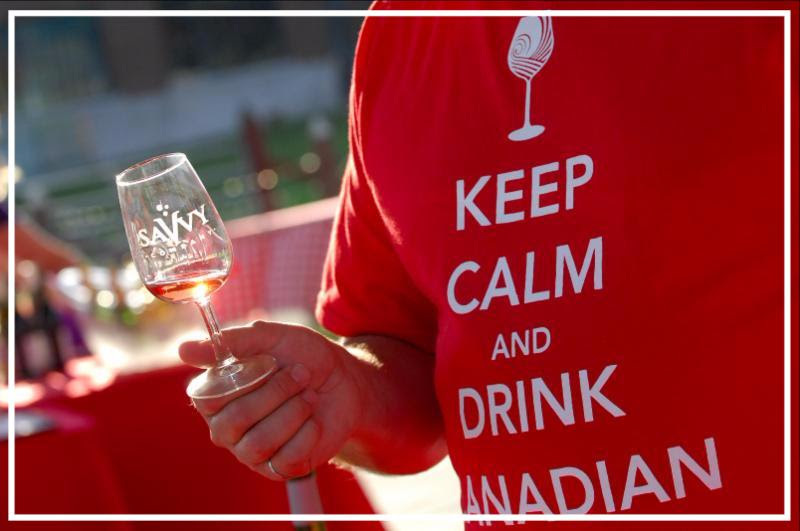 Everything at this event is OUTSTANDING…you won’t find any of the featured bevvies at the LCBO. To top it all off…cheesemakers from Quebec & Ontario will be serving & selling their delicious artisan cheeses. And locally made woodworking, festive cookies, handmade preserves & neat gourmet treats – all ready-to-buy as gifts or to serve when you have people drop by during the holidays. Check out who is coming…. To make your holiday shopping easy, we will give you FREE shipping when you order 6, 12 or more bottles of ANY combo of your favorites bevvies & Santa will hand deliver (aka by courier) to your home or office – absolutely FREE – in time for the holidays! You can still order & take advantage of the FREE shipping & special event prices. Email the Savvy Team or call us on 613-SAVVYCO (728-8926) to arrange a special order or to be provided the special web site link for online ordering (we’re getting it ready now!). Ho-Ho-Ho…we have 4 tickets to give away! Tell us what goodie is always in your stocking. At my house, Santa always leaves a mandarin in the toe of our stocking. What is your tradition? Send an email to cheers@savvycompany.ca & we’ll enter you into the draw for 4 free tickets to Outstanding in their Fields. This will be an OUTSTANDING holiday shopping event – don’t miss it! Valentine’s Day♥ is right around the corner. If you still haven’t found ♥THAT PERFECT GIFT♥, then we can offer you something really different♥♥. We’re hosting our 2nd annual Wine, Craft Beer & Artisan Cheese Tasting♥ at the Diefenbunker♥. It’s a date night♥ like no other! Book your tickets & join us for a fun evening exploring the fascinating Cold War Museum while sipping & sampling hard-to-find Ontario wines, craft beers & artisan cheeses♥. Take it all in! A complementary guided tour of the Diefenbunker will be offered before OR after the tasting event. Then at 7pm the corks will start popping, the Bunker will be filled with music & Savvy Company’s Cheese Sommelier will serve a variety of Canadian artisan cheeses. As you mix & mingle in the Bunker’s Cafeteria, our Savvy Sommeliers will lead you through a ‘TOP SECRET’ blind tasting where the bottles of sparkling, white & red wines along with craft beers will be disguised. There’ll be fun guessing the style of wine & craft beer before we unveil the truth. Each bottle – wine & craft beer – will be wrapped in foil so that you can’t see the label. Sip & sample then make your best guess to what it might be. A Chardonnay? An IPA? Or possibly a Pinot Noir? At the end of the evening our Savvy Sommeliers will peel back the foil & uncover the truth of each bottle. Ooohs, ahhs and “I told you so” are guaranteed to be heard. Book quickly – this unique event almost sold out! 10% off for Diefenbunker members & Inner Square cardholders. Call the museum for your top secret discount code! 613-839-0007. All ticket prices include wine, craft beer, cheese samples & good ol HST. The Museum Team & our team of Savvy Sommeliers look forward to seeing you at this one-of-a-kind event. It’s beginning to look a lot like Christmas at Savvy HQ! To help craft beer lovers across Ontario get into the holiday spirit, we have created the first-ever Hoppy Holidays Advent Calendar featuring hard-to-find craft beers made locally in Ontario. Our Savvy Hip Hops subscribers have repeatedly requested (some have begged – LOL!) for this one-of-a-kind sudsy treat. All of us in Savvy Brew Crew worked hard to make this happen in time for the holiday season. What’s in the Advent Calendar? Our Hoppy Holidays Advent Calendar is a 2-4 of delicious craft beers that we have curated from breweries from across the province. Each box contains 19 cans (473 mL) & 5 bottles (650mL ) – no two beers are the same & there’s no duplications. It’s an assortment like you have never tasted – there’s every style of beer you can imagine. Beer lovers are snapping them up! 100 Advent Calendars were made…and there are only a dozen left. Want one? $88 & shipping is FREE. The price for Hoppy Holiday Advent Calendar is the total combined cost of all of these delicious craft beers. Your credit card will be charged directly by the featured breweries for the retail cost of their beer in your Advent Calendar. In the spirit of Christmas…shipping is FREE. Hop to it & join the fun discovery. Psst...share this secret with a friend and we’ll send you $50 gift certificate that you can use for tickets to Savvy Events next year. We have craft beer events in the works that we know you’ll love. Simply have your friend mention your name on the order form where it asks: How did you hear about Hoppy Holidays Advent Calendar?